an unlikely family fleeing to shared safety. This entry was posted in sunday sarahnade and tagged canada geese, captured moment, nature poem, sandbill crane by sarahwbartlett. Bookmark the permalink. Hey, Rita! Looks like you’ve spent some time perusing my site – thanks! This was so amazing, the juvenile sandbill crane hanging around with a flock of canada geese. Everytime we got near (or more precisely Loki) he warned the others with a most incredible call (google it, it’s distinctive) and they all took off together. Happened several days running. I think there might be an ‘ugly duckling’ story in there!!! Yes, I have been randomly reading through your work on the site and really enjoying it. I will try to comment more. Cool story about the crane. Thanks, Rita. 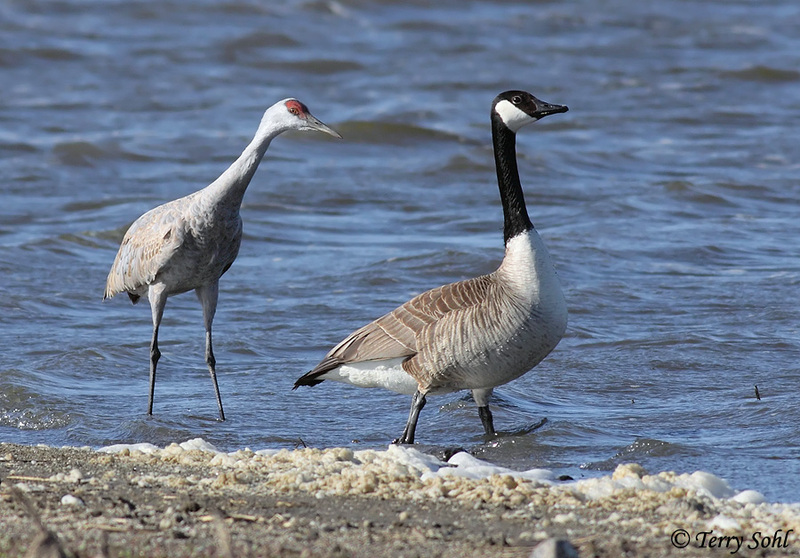 He was definitely part of the flock.Check out the call of the sandbill crane – very distinctive!! !